Because rice is supposed to be mildly sticky, not drowned in butter. Is that a rice rule or something? 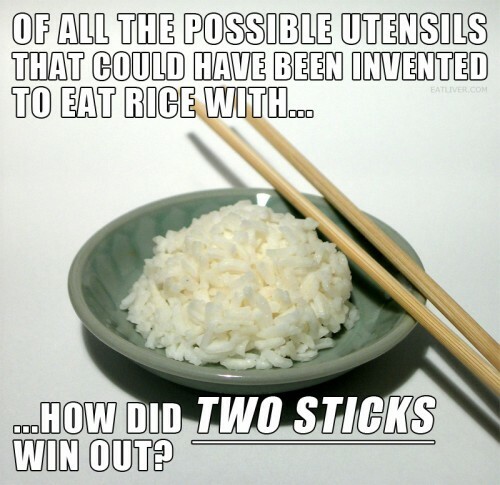 Actually, chopsticks were used by the Chinese mostly for noodles. As far back as the Song Dynasty they had spoons. Nope. Taiwanese American here. Grew up with chopsticks all my life. I can tell you right now, chopsticks are pretty much used for almost everything. It’s essentially a spork, spoon, fork, and knife all in one. Only more effective. It is none of those things. It’s a pair of sticks. I guess those old Song Dynasty spoons and forks they found were put their by aliens . . . who woulda thought? There instead of their of course. Japanese rice is a bit stickier than your Uncle Ben’s and they don’t drown it in butter. The spoon is only meant for sipping liquid, not for shoveling food in your face. Only a round-eye could be asking this. You can find sticks anywhere – you need an iron mine and a forge to make steel flatware.